Leptochloa asthenes (Roem. & Schult.) C.E.Hubb. Description: Tufted perennials to c. 1 m tall. Culms erect, smooth, branched, glabrous; nodes numerous, glabrous. 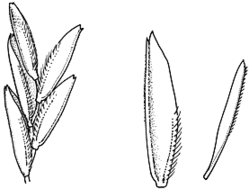 Sheaths tight around culm, ribbed, scabrous, upper margin with sparse tubercle-based hairs to 2 mm long; ligule membranous, 0.5–1 mm long, truncate, erose; blade 2–9 cm long, to 0.3 cm wide. Inflorescence of racemes on a primary axis, 10–25 cm long, axils glabrous; racemes 1–9 cm long. Spikelets 1.5–3 mm long, 2–5 florets, often with the rachilla extended as a sterile projection to 1 mm long, pedicels to 1 mm long. Lower glume lanceolate, c. 0.7 mm long, subulate, 1-keeled, keel scabrous; upper glume elliptic, c. 1.5 mm long, emarginate or obtuse, 1-keeled, keel scabrous. Lemmas c. 1.5 mm long, upper lemmas successively smaller, apex acute or 2-toothed, 3-nerved, lateral nerve to margin with fine hairs <0.3 mm long, 1-keeled, sometimes lower 50% of keel silky with fine hairs <0.3 mm long; palea slightly shorter than lemma, 2-keeled, keel to margin with fine hairs <0.3 mm long. Grows in moist, protected situations. Text by (2008) Jacobs, S.W.L., Whalley, R.D.B., Wheeler, D.J.B. Taxon concept: Grasses of New South Wales 4th ed.